It’s never a boring day when Alfa Romeo invite you to something - last month I drifted over balloons filled with paint - and the other week I was driven around Silverstone by a blindfolded driver. 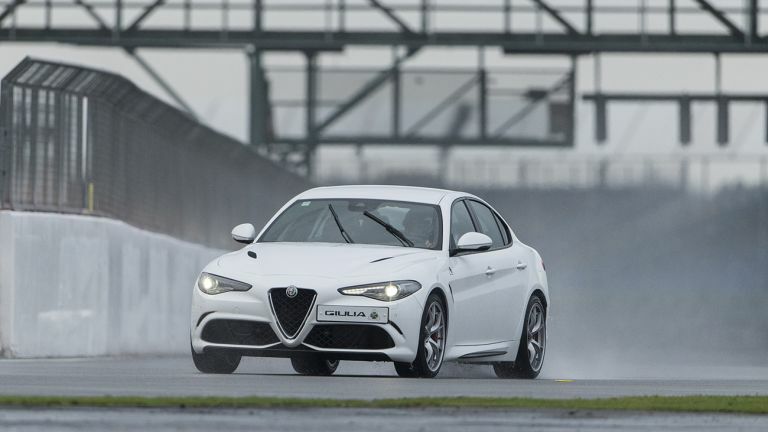 I arrived at Silverstone with slight apprehension, all I’d been told was I’d be driving the new Alfa Romeo Giulia Quadrifoglio. So far, so good, but when I got out of my car at the circuit, I was told about the blindfolded lap. Gee, thanks Alfa. First up were my laps around Silverstone’s National Circuit. I jumped in the super saloon, and started the 510hp, 600Nm Bi-Turbo V6 engine. It sounds glorious. It had just stopped raining so the track was greasy, making the first few laps even more fun. Next it was time to hop in the blindfolded car. The windows had been completely blacked out with a vinyl cover, in the cabin there was only the instrument panel for illumination. I was told not to distract the driver in anyway, as, believe it or not, this stunt requires absolute concentration. He exited the pit lane by sticking his head out of the window, but after that the windows rolled up and we were in pitch black. Behind us was another Giulia who could see where they were going - relaying information back to our driver. I tried to imagine where we were on the track, but after the first few turns was completely lost, simply focusing on the speedometer instead, nervously watching it rise to 95 mph. After two minutes the ride was over, and we headed back into the pit lane. This lap wasn’t flatout, but earlier in the day Ed Morris completed the circuit in 1:44.3 seconds with David Brise directing him, hitting speeds of over 100mph. This time matched the National Circuit lap record set in 1951 by Italian F1 World Champion Nino Farina in a Alfa Romeo 159. Now the question is, how fast did I make it around Silverstone’s National Circuit? And was it faster than Ed? Looking back at the GoPro footage I managed a 1:28.5 on my penultimate lap, so I'm officially faster than a (blindfolded) race car driver, although, I don't think I'll be replacing Nico Rosberg at Mercedes any time soon.